Sidney firefighters battle a fully involved house fire at 2021 Old English Court on Wednesday, April 10. The Sidney Police Department reported a man and two dogs were rescued from the house. The fire started at about 11:30 a.m. Lockington and Anna fire departments also responded. 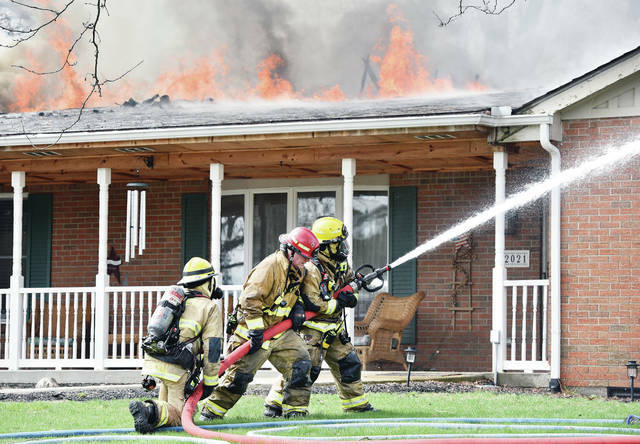 SIDNEY — Sidney firefighters battled a fully involved structure fire at 2021 Old English Court on Wednesday, April 10, at around 11:30 a.m. The fire took several hours to extinguish. According to a press release from the Sidney Fire Department, when Sidney firefighters arrived, they found a single-story, single-family residence with heavy fire showing through the roof. Officers from the Sidney Police Department assisted in rescuing the only resident at home at the time of the fire, along with two dogs, prior to the fire department’s arrival, the release states. The occupant was transported to Wilson Health for a medical evaluation. A box alarm was dispatched to recall all off-duty Sidney firefighters, as well as Anna Fire Department, Lockington Fire Department and Anna Rescue Squad. A special call was made for Port Jefferson Fire and Perry Port Jefferson Rescue to man the Sidney Fire station. The Dayton Power and Light Company also responded to secure the power at the home. According to the release, the fire caused a total loss to the property, estimated at $168,340, and $100,000 to contents. No injuries were noted to firefighters or police officers. The cause of the fire remains under investigation by the Sidney Fire Department investigation unit.